It’s a delicious korean food that I know you will love. When I was in America 10 years ago, I made gimbap for a potluck party. One Ukrainian lady was eating my gimbap, but peeling off the “black paper.” She thought that it was real paper, and she only wanted to eat the delicious stuff inside! I make 2 kinds of gimbap in this video, so be sure to watch until the end for special bonus footage. Mix rice with the mixing sauce and stir it evenly. Set it aside for now. Add 1 tbs of soy sauce, ½ tbs of sugar, 1 clove of minced garlic, and 1 ts of ground black pepper. Keep stirring for another 3 minutes. Turn off the heat and add 1 chopped green onion, 2 ts of sesame oil and 1 tbs of toasted sesame seeds. Place 3 yellow radish pickle strips on the plate. Place 3 pieces of crab meat on the plate. Slice an avocado and place it on the plate. Place a sheet of seaweed(“kim”) on the bamboo mat and evenly spread a layer of rice in the center of it. Place 2-3 spoons of seasoned tuna flakes on top of the layer of rice. 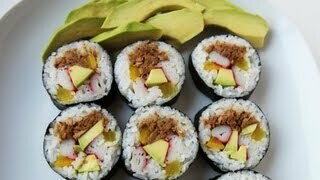 Add a yellow radish pickle strip, some avocado, and a red crab meat strip. Roll it up gently using the bamboo mat. *tip: prepare a wet cloth or paper towel to wipe the knife while cutting, it will make it slice easier. ½ cup of chopped Kimchi, ½ tbs of hot pepper paste, 1 ts sugar, ½ tbs of sesame oil, ½ tbs of sesame seeds, and 1 chopped green onion. Posted on Sunday, August 26th, 2007 at 8:43 pm. Last updated on April 26, 2015. Posted October 24th, 2018 at 10:08 am | Log in to reply. Thank you, I loved your nutritious gimbap. Posted August 11th, 2018 at 9:50 am | Log in to reply. Posted August 13th, 2018 at 9:06 am | Log in to reply. You can use any canned tuna for this recipe. “I will be making some gimbaps for a party next weekend.” You will have to wake up early in the morning to make gimbap on the party day and don’t keep it in a cooler. That’s what I’m doing. Rice will go hard at cool temperature. Posted November 13th, 2017 at 4:02 am | Log in to reply. hi maangchi is there any alternative for avocado? Posted December 13th, 2016 at 4:16 pm | Log in to reply. Posted December 14th, 2016 at 10:26 am | Log in to reply. You need something crispy and salty. How about using salted cucumber sticks? Posted December 14th, 2016 at 5:31 pm | Log in to reply. This recipe was originally posted on August 26, 2007 at 8:43 pm by Maangchi. It was last updated on April 26, 2015. The video was watched 553,838 times on YouTube & has 2,218 likes!